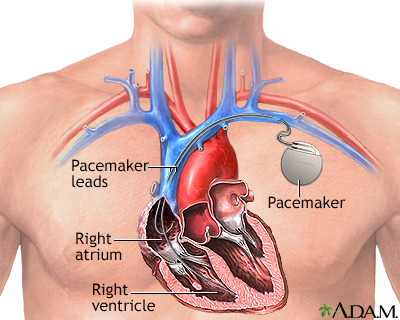 A pacemaker is a small, battery-operated device. This device senses when your heart is beating irregularly or too slowly. It sends a signal to your heart that makes your heart beat at the correct pace. The generator contains the battery and the information to control the heartbeat. The leads are wires that connect the heart to the generator and carry the electrical messages to the heart. A pacemaker is implanted under the skin. This procedure takes about 1 hour in most cases. You will be given a sedative to help you relax. You will be awake during the procedure. A small incision (cut) is made. Most often, the cut is on the left side (if you are right handed) of the chest below your collarbone. The pacemaker generator is then placed under the skin at this location. The generator may also be placed in the abdomen, but this is less common. A new "leadless" pacemaker is a self-contained unit that is implanted in the right ventricle of the heart. Using live x-rays to see the area, the doctor puts the leads through the cut, into a vein, and then into the heart. The leads are connected to the generator. The skin is closed with stitches. Most people go home within 1 day of the procedure. They are not permanent pacemakers. Pacemakers may be used for people who have heart problems that cause their heart to beat too slowly. A slow heartbeat is called bradycardia. Two common problems that cause a slow heartbeat are sinus node disease and heart block. Some pacemakers can be used to stop a heart rate that is too fast (tachycardia) or that is irregular. Other types of pacemakers can be used in severe heart failure. These are called biventricular pacemakers. They help coordinate the beating of the heart chambers. Most biventricular pacemakers implanted today can also work as implantable cardioverter defibrillators (ICD). ICD restore a normal heartbeat by delivering a larger shock when a potentially deadly fast heart rhythm occurs. Punctured lung. This is rare. Puncture of the heart, which can lead to bleeding around the heart. This is rare. A pacemaker senses if the heartbeat is above a certain rate. When it is above that rate, the pacemaker will stop sending signals to the heart. The pacemaker can also sense when the heartbeat slows down too much. It will automatically start pacing the heart again. Always tell your health care provider about all the drugs you are taking, even drugs or herbs you bought without a prescription. You may be asked to wash your whole body below your neck with a special soap. You may be asked not to drink or eat anything after midnight the night before your procedure. This includes chewing gum and breath mints. Rinse your mouth with water if it feels dry, but be careful not to swallow. Your provider will tell you when to arrive at the hospital. You will probably be able to go home after 1 day or even the same day in some cases. You should be able to return to your normal activity level quickly. Push, pull, and twist your arm for 2 to 3 weeks. Raise your arm above your shoulder for several weeks. When you leave the hospital, you will be given a card to keep in your wallet. This card lists the details of your pacemaker and has contact information for emergencies. You should always carry this wallet card with you. You should try to remember the name of the pacemaker manufacturer if you can in case you lose your card. Pacemakers can help keep your heart rhythm and heart rate at a safe level for you. The pacemaker battery lasts about 6 to 15 years. Your provider will check the battery regularly and replace it when necessary. Swerdlow CD, Wang PJ, Zipes DP. Pacemakers and implantable cardioverter-defibrillators. In: Zipes DP, Libby P, Bonow RO, Mann DL, Tomaselli GF, Braunwald E, eds. Braunwald's Heart Disease: A Textbook of Cardiovascular Medicine. 11th ed. Philadelphia, PA: Elsevier Saunders; 2018:chap 41. A pacemaker is a small, battery-operated electronic device which is inserted under the skin to help the heart beat regularly and at an appropriate rate. The pacemaker has leads that travel through a large vein to the heart, where the wires are anchored. The leads send the electrical impulses to the heart to tell it to beat.